Why not bring some cheerfulness into the garden with flowers? We’re lucky to be able to grow many spectacular tropical flowering trees, shrubs and vines as well as the more traditional English-style perennials and bedding plants. The cultivation of annual flowers, or even herbaceous perennials, is not as popular as it once was, but with our water problems eased at at moment, why not give it a go? If you don’t have much space in the garden, you can still create eye-catching displays in pots and planters and brighten up balconies, patios, and paved areas. While it’s too late to plant most spring annuals from seed, in frost-free areas you can can still sow some for later flowering. A few varieties that are readily available in seed packets to try now include alyssum, nasturtium, pansy, viola, johnny-jump-up (heartease), amaranthus, celosia, lobelia, cleome, salvia, coleus, verbena, petunia, dianthus, californian poppy (eschscholtzia), snapdragon. Seed of perennials can be started just about any time if you can care for them, especially keeping them away from frost at this time of year, but germination will be slow in cold weather. If you sow into smaller pots or seed trays you can get them started in a warmer place indoors, as long as you check them regularly and bring them out into the light at the very first sign of emergence (or before) and harden them off to the sun gradually. An alternative is to buy seedlings from the garden centre, which will save you effort plus several weeks growing time. More advanced plants already in flower are more expensive but the way to go for colour immediately prior to a special occasion like a party or garden wedding. Many veggies are happy growing in the cool conditions of the SEQ winter, but if you didn’t get plants started off in autumn, you might find that seed germination will be poor in the coldest months. If you have spaces left to fill, try starting seed off in pots and trays in a warmer pot such as a patio or indoors, (provided they aren’t starved of light after emergence), or save time with some seedlings from the garden centre. The exception is those that are normally sown direct, like beans and peas. In June, try sowing broad beans peas, lettuce, English spinach, silverbeet and beetroot, carrots, onions and garlic, cabbages, broccoli, kohlrabi and turnip. In frost free areas, also regular beans, tomatoes, capsicums, eggplants, zucchini, squash, cucumber. Meanwhile, vegetables sown in autumn should be coming along. Keep up the water if there is no rain (winter is traditionally our dry time) and apply regular supplemental feeding with liquid fertilsers. Strawberries will be starting to fruit. Mulch around the plants with a loose dry mulch like sugar cane to keep fruit clean and dry off the ground. Chicken wire or vegetable garden nets might also be necessary to keep the local wildlife from getting to your fruit before you do. 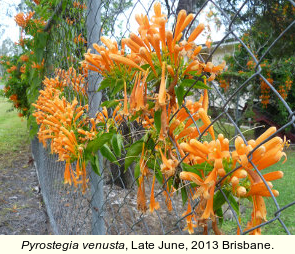 … these suggestions from our friends at Qld Gardening. This entry was posted in Blog and tagged winter. Bookmark the permalink.